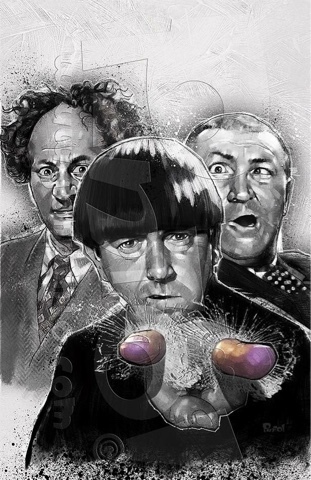 Truth be told, and I know I'm gonna hear about this, I've never been a big fan of the Three Stooges. I like them. I watched them in TV as a kid but they were never my favorites. I much preferred The Marx Brothers or Abbott and Costello. But when the opportunity arose for me to paint these guys for a comic book cover, I jumped at the chance!! I rarely find myself "clever" but when this idea of breaking the fourth wall popped into my head, I just HAD to do it!! 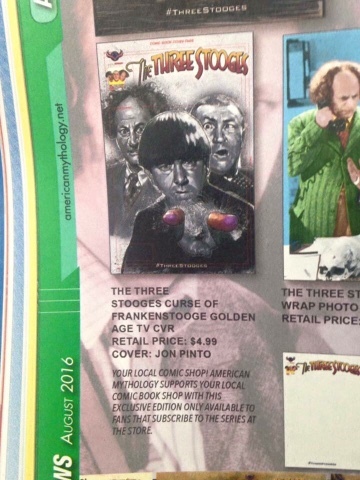 I'm also thrilled that this is seeing print and I was jazzed that a picture of it as well as my name was in the recent issue of Previews! The comic comes out in October by the way.